Click on the image to the left to find out more about how your church can gain a clear and actionable picture of its overall health. 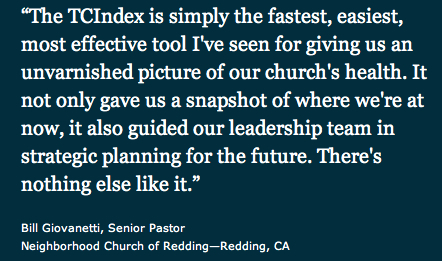 The TCI does an incredible job of taking the "pulse" of your congregation, and puts primary emphasis on the strengths you can build on for maximum effectiveness. TAG Consulting (with whom I'm affiliated) is also ready to work with you and your leadership team to go as far as you want to in terms of visioning, organizational design, ministry development, stewardship efforts, etc. The TCI is a unique, and proven starting point for this, and I encourage you to take advantage of this unique and immediately usable resource!